Binghamton Website Hosting is a full service web design, ongoing support, IT consulting, and managed web hosting company based in Binghamton, NY. Binghamton Website Hosting provides feature-rich web site hosting services on Microsoft Windows Server combined with inspired, state-of-the-art professional web page design. Since 2000, Binghamton Website Hosting has used a broad range of custom programming techniques and smart database design to make web sites more useful, unique, search engine friendly and easy to update. Simply put - Binghamton Website Hosting delivers effective web sites with outstanding support and great return on investment. After all, just having a site on the world wide web is not enough! People should remember your web site, have a pleasant experience using it, and return to visit it again in the future. Contact us today to see what Binghamton Website Hosting can do to make your web site more powerful, productive and profitable. All Binghamton Website Hosting web sites are quoted on a per-project basis. Your business is unique and deserves more than a generic pre-made web site template. A web site expert from Binghamton Website Hosting will learn more about your business before recommending a site plan that fits your needs and goals. Having someone understand your business, specific needs and objectives is the only way a functional web site that will exceed your expectations can be created. Please use our Contact Form to setup a meeting or to be contacted by email or telephone. 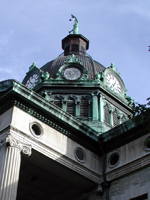 If you are in the Binghamton area we would be happy to stop by your office or business. Binghamton Website Hosting looks forward to the opportunity of working with you on your web project. Binghamton Website Hosting has designed and programmed hundreds of websites! Please take a moment to view some of them in the Binghamton Website Hosting web site design portfolio. Thanks for visiting Binghamton Website Hosting and please visit us again soon. News & Tips and answers to your questions are put online here frequently. If you have any questions please feel free to Contact Us.